The basis of Hit Location Larp is that all weapons deal one point of damage. No matter how experienced or how strong a players persona is, they still only deal one point of damage. What about portraying a character with “The Strength of 10 men“, or a monstrous troll that attacks not with clubs but with whole trees? Siege damage represents massive damage beyond what mortals are capable of. 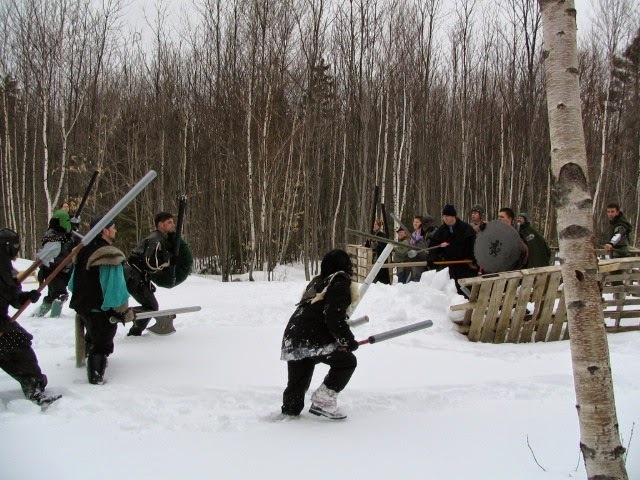 The addition of Siege damage to a larp can shake up a stale combat system. Also it’s immensely fun! Let’s take a look. Siege damage represents large boulders, catapult shot, ballista shot. Weapons which do damage above and beyond the what a normal person is capable of with a single swing of the sword or club. Therefore the weapons which cause siege damage should be represented by something more than a piece of pipe insulation. To accurately communicate to other players that siege damage is being used against them, the weapons have to look the part. Players should either make or purchase bean bag chairs, or foam rocks. Making a boulder is probably a fairly easy DIY project, especially with extra foam left over from weapon construction. But getting a bean bag chair, and creating a cloth cover might be a better alternative. 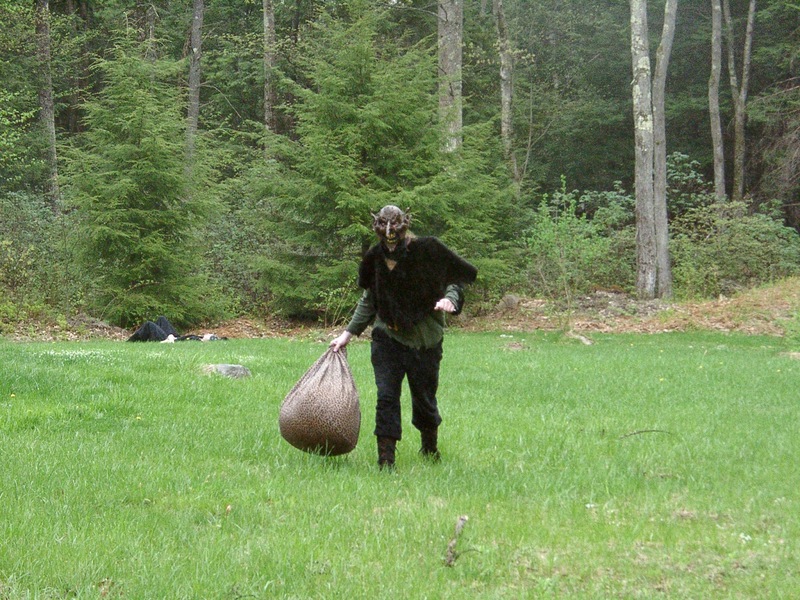 Or perhaps you play in a larp that enjoys constructing fortifications. It might be nice to make the defenders start to worry when the trebuchets roll out. Or maybe they have a troll. Wooden Palisades may not take much damage from a sword or axe blow, but a boulder? That should have an impact. Adding the rules for siege damage is a great opportunity to do this. Siege engines and castle walls, although a fun idea, will most likely be fairly rare due to the resources needed to create such things. More commonly players are going to be facing some form of monster which has the ability to catch and throw boulders. For example the Forest Troll. Here we have a Troll, specifically a Forest Troll. They are bestial creatures who don’t really understand tool use, so they don’t use weapons. Forest trolls have two abilities: Full Regeneration and Strength. Simply put Regeneration means they keep getting up and fighting. Forest Trolls don’t have much in the way of smarts, but what they lack in intelligence they make up for in cunning and strength. Normally moving a boulder would take three players each grabbing the boulder, to simulate great size and weight. None of them can hold anything other than the boulder, and they would not be able to use it as a weapon. The Strength ability allows the troll to catch and throw boulders as weapons by themselves. Boulders count as Hand and a Half weapons, which means the player cannot hold weapons or shields while using a boulder. The boulder can be thrown or caught either one handed or two handed, but the player cannot have anything else in the other hand. Remember, never catch two boulders at once. While this is not critically important for the troll to remember, it is very important to players who have strength from some magical means. Wesley, a persona, usually fights with a two handed spear. Wesley also drank a potion of Strength. While walking through a lightly wooded area, near a clearing, Wesley is attacked by a hungry Forest Troll. The troll throws the boulder at his presumed meal. Wesley, who drank the potion confidently reaches out to catch the boulder with one hand. However the boulder is larger than he thought it was at first glance. Unfortunately the strength potion wasn’t quite powerful enough to stop the boulder, and Wesley is crushed. The Troll feasts. Brandon, a player, usually fights with a two handed spear. He also drank a potion of Strength. While walking through a lightly wooded area, near a clearing, Brandon is attacked by me playing a Forest Troll. I can see that he has his spear in one hand, and he’s acting very confident about this fight. So he probably has strength. I fake a toss at him then throw the boulder on the rebound. As expected he catches the boulder one handed. But he forgets to drop the spear. Brandon has a two handed weapon in one hand and a hand and a half weapon (the boulder) in the other, which is not a legal weapon combo (as Wesley does not currently have the 4 arms needed to wield two two handed weapons). The boulder deals siege damage to Brandon which is 1 point of damage to all hit locations. Unfortunately Brandon is not armored, and is killed. You can see him dead in the background of the picture. Unfortunately you can’t see the troll pretend to feast on the corpse of Wesley, but it was awesome! Thrown boulders do the most basic type of Siege damage. Should a player be struck with a boulder all weapons and shields on their person are Broken then they take 1 point of damage to every hit location. Broken weapons cannot be used until Repaired either by spell or smith. Additionally any potions carried are destroyed. Most magical items, including banners and heraldry, are not destroyed by Siege damage. Magic items will state that it is destroyed by siege if vulnerable. Note: Unlike the rules for normal boffer or latex weapons, to be siege damage, the weapon must be thrown. The Troll cannot hold onto the boulder. Please prevent the game from descending into a pillow fight, by actually releasing the boulder. If you want a pillow fight that’s a different game. Based on the amount of damage done by a boulder, a warrior wearing Plate armor would survive being struck by a large rock thrown by a troll as plate armor provides 2 points of armor on all hit locations. They would not have much left they could do besides run away, but they would be alive. However a warrior who forgets their helmet would still be dead. Sometimes boulders can be deflected by real tree’s, tossed weapons, tossed shields or magical shields. Good reflexes can prevent the damage by simply getting out of the way. This means that boulders are not a perfect offensive weapon. Also some hilarious situations can result from poorly or inaccurately tossed boulders. Kind of a crappy pallet palisade, not a great defense, but it was free. Catching and throwing boulders is only a basic part of the broader topic of Siege Damage. Sturdy structures can defend against siege attacks. Wooden defensive structures are immune to attacks by most normal hand held weapons (unless the weapons are magic). A wooden palisade can take one strike of siege damage before being destroyed. When attacking a castle, a Forest Troll might make a good ally. Any given segment of wooden wall (whether that’s a wooden pallet or a tarp) can take one strike of Siege Damage. The next strike will destroy that section. Wooden buildings, such as homes or regular buildings, would be destroyed on the first hit of Siege Damage (but are still immune to normal weapon blows). Marshals may need to be appointed to keep track of siege damage in battle, and to knock down wall sections as needed. A large part of 4x game play is acquiring better resources. As players build using stronger materials the amount of Siege Damage a structure can withstand will go up. Building stone fortifications provides greater protection from Siege. For prototyping purposes we’re going to be testing just Wooden Palisades and thrown boulders. As the game system expands and the players find better materials in game stronger structures will be available for construction. Does siege damage, and throwing around bean bag chairs sound like fun? Or is it too much to keep track of for a hit location larp? As always you can tweet me, @jspringfield211 or join our Facebook Group. Leave comments or questions on the Google Plus page. A Paper Prototype, or a Quick Break from Larp.